At Codemenders Oy, we offer two flavors of Qtip.me. One is the standard “Software as a service” flavor (for anyone to register and start using at www.qtip.me) and other, the enterprise or corporate flavor (focusing more towards the on-premises needs of our corporate customers). It was a pleasant surprise to note that we’ve served more than a hundred thousand customers on the “Software as a service” flavor of Qtip.me. We decided to shout about it in our holiday greetings this year. While we knew this was coming, we were just not sure that Santa will bring this gift for us so early. 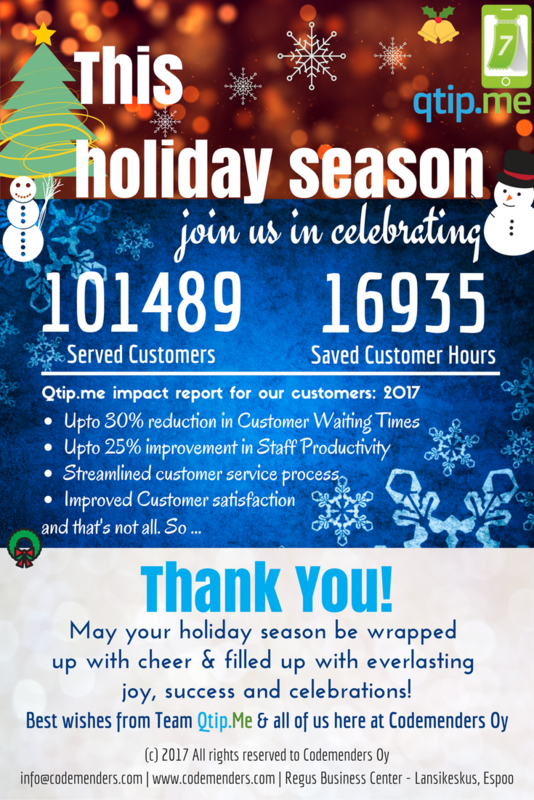 Happy to announce that Qtip.me handled its 100,000th customer (consumer) on December 18th, 2017 and we are still counting. No wonder, the holiday season also brings in a lot more queues for our customers and we are happy to be a part of their efforts to make their customers happier! Please note, the impact report (related to Customer Waiting Times and Staff productivity) are in comparison to similar numbers from 2015-2016 timeframe.